Greece and Grapes together with Yiannis Karakasis meet the chef of Aleria, Gikas Xenakis, and have a relaxed talk about gastronomy and wine. Originally published in Greece and Grapes, The Master's Voice. 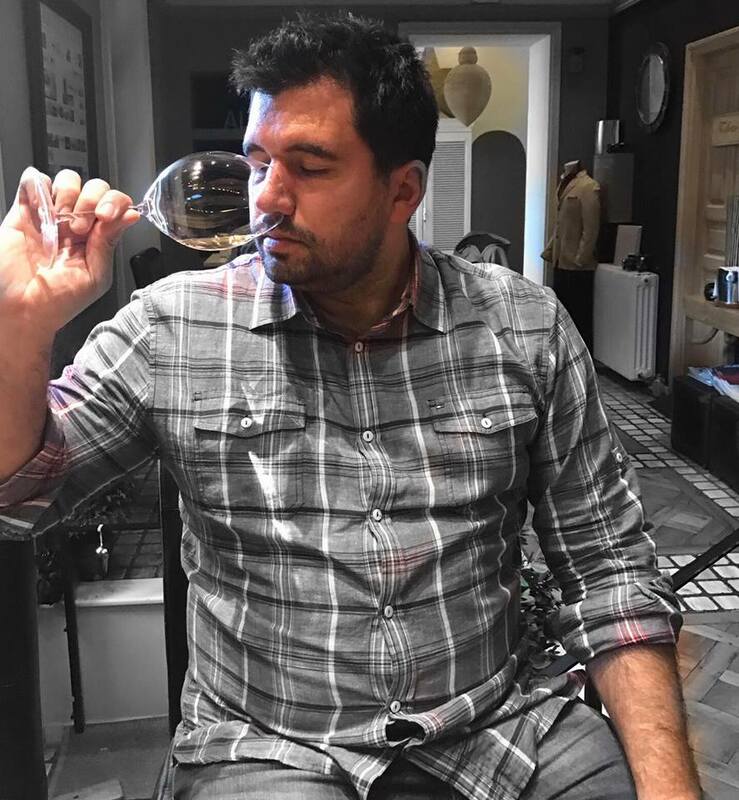 Yiannis: How did you become a wine afficionado? Gikas: Basically, with my involvement in gastronomy, and especially fine dining, which is what I deal with, I was introduced to the concept of “good living” and thus acquired culture. As you might imagine, I did not come from a very affluent family that enabled me to frequent expensive restaurants. Through my love for gastronomy I started going out, going to restaurants and slowly grasped the meaning of wine. I think gastronomy and wine go hand in hand. Yiannis: Is there a single moment that you would consider as your trigger experience with wine? Yiannis: Could we talk about Greek cuisine, and if so what are its elements? Gikas: This is a question that has tortured many cooks, journalists and others who are involved in gastronomy and food. Personally, I do not like labels; why narrow things down so they fit into a specific box, I do not see the point. What are the boundaries of Greek cuisine? We've had so many conquer this country, Venetians, Turks, we also have so many other influences, like from Pontos. We are in fact an amalgamation of all these elements, and if we absolutely want to define Greek cuisine I would say that it is a combination of its terroir and its products. Let's look at a classic example to understand the mix. Pastitsio, which is also a famous dish at Aleria, has an Italian name and is comprised of pasta; an idea that originated in the Ionian Islands, which had Venetian influences, and traveled to Athens. We loved it so much that we consider it our own, synonymous with Greek cuisine. There is Greek cuisine, but I would say that under certain conditions and with an aspect that is focused basically on the products of its land. Yiannis: How important is wine for Aleria? Gikas: It is a very important part, because we offer a total experience and wine is its main ingredient. Of course the wine list was not put together lightly; the owner Nikiforos Kehagiadakis has a passion for wine and after much discussion and our good cooperation, we ended up with a wine list of about 200 labels, which caters to different budgets . It's part of the experience. I see foreign customers especially, who feel charmed and happy to have tasted Greek cuisine and Greek wines. Yiannis: Which are your favourite spots for food and wine? In any order you prefer. Gikas: I have several different places I enjoy. 'Kritikos' for its top meat, and 'Kavos' at Isthmia for its amazing fresh fish. I like Nolan very much at noon and in the evening, and of course Spondi and Funky Gourmet. I have different choices for the different days of the week and for the different hours of the day. As far as wine is concerned, I have fun at Lithinon, in Saronida, and Oinoscent. Both have many interesting choices of wine. Yiannis: Which are your favourite culinary destinations? Gikas: Definitely Paris, I had nice dinners in Sydney, in New York you can find anything you wish for, and London is on another planet. All the metropolises I would say are way ahead in terms of the food they offer. Υiannis: Which is your ultimate pairing of wine and food? Gikas: Difficult to choose, but I would say a good piece of meat with Cabernet Sauvignon. Rather classic, but nevertheless a rocking combination. 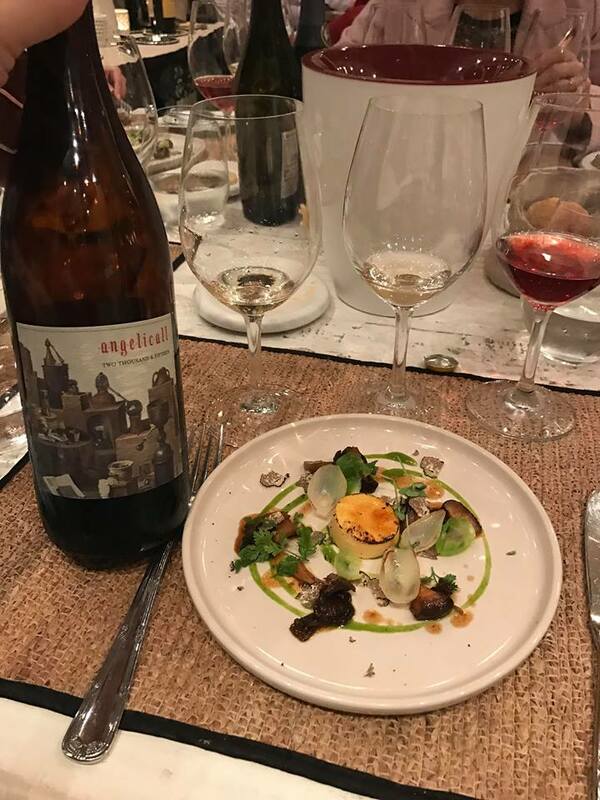 Yiannis: How difficult is it for a restaurant to evolve the wine pairings? Gikas: It's definitely not easy. It takes effort and expense, several bottles need to be opened before you can present your version of pairing perfection to your audience. Especially when you do it at attractive prices, like ours, close to 30-35 euros. In other cities the wine costs you as much as your meal. Yiannis: And what do you like to drink with your meals? Gikas: Santorini and Assyrtiko in general, Meursault from Burgundy and Lugana from neighboring Italy. I also like Malagousia and Robola of the white varieties. Yiannis: Some other wines that hold a special spot in your heart? Gikas: Both Toinos Clos Stegasta are unique, Sigalas, Hatzidakis also, Boutari and the Musses Estate with the particular Mouchtaros! I like this wine a lot! Yiannis: How important is the role of the sommelier in a fine restaurant? 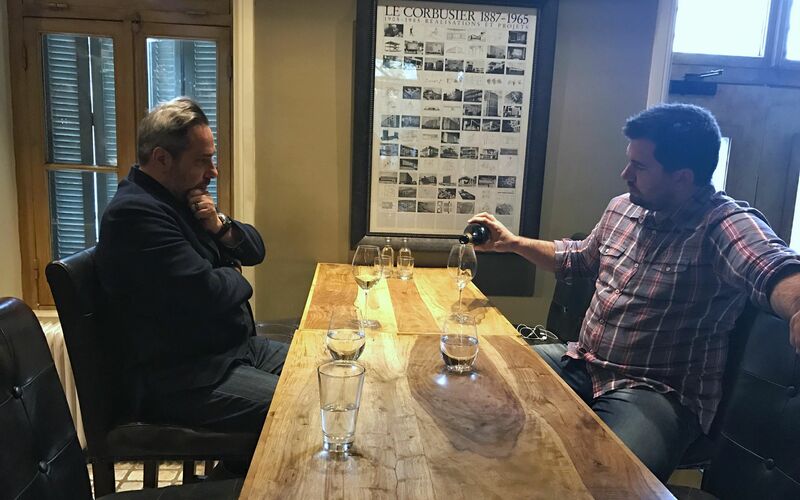 Gikas: I think the sommelier is of prime importance; both for helping select the wines, as well as communicating them to the customers. We have three people, Stathis who is the head sommelier, Eftychia and Michael, but almost everyone on the team knows the basics about wine. Giannis: What do you think about having music in a restaurant? Gikas: Basically, it should not be annoying and should allow customers to talk. Light jazz is ideal, I think. On the other hand, I do not quite agree with its complete absence, as they say about the star restaurants. My personal view supports a comfort dining with enough freedom. You do not have to go somewhere well and be dressed as a groom, sterilized does not do good. What we must strive for is careful and not bulk. Giannis: What do you think about the street food bloom in the Athenian gastronomic scene? Ghika: I think it still needs a lot of work; I watch the street food scene very closely on all my travels. There is a time lag in our country; things which are happening globally reach Greece after several years. BAO, for example, was 'hot' in New York in 2013, now there are other trends. We have at least three years delay. On the other hand, I am very pleased with the people from 'Cookoovaya', who opened the 'Hoocut', and who dared to do something different; the absolute street food: souvlaki. Yiannis: What is your view of the Michelin star? Gikas: It is a serious institution in the world of gastronomy. It is a great reward and it is also recognition of the effort and hard work a restaurant team has put in, since the standards it sets are very high. I would like it very much if Aleria could achieve its first star. This should not be an end in itself. Our primary concern is to make our customers happy.